Enlarging the one I am working on by 550% gives me the idea of what it will look like in the end. I have compleated the last kayak and popped him in, added lips & eyes, and I really think it looks better with no details, just colours and lines that way. It really emanates the feeling of kayaking, simple, no fussy bits, just the necessary things like: you, the kayak, and the water (& the paddle). Well I sure hope Craig sees it that way, haha. I’ve really had enough of it for today so I think having a break from it will give me new vision when I get back to it. 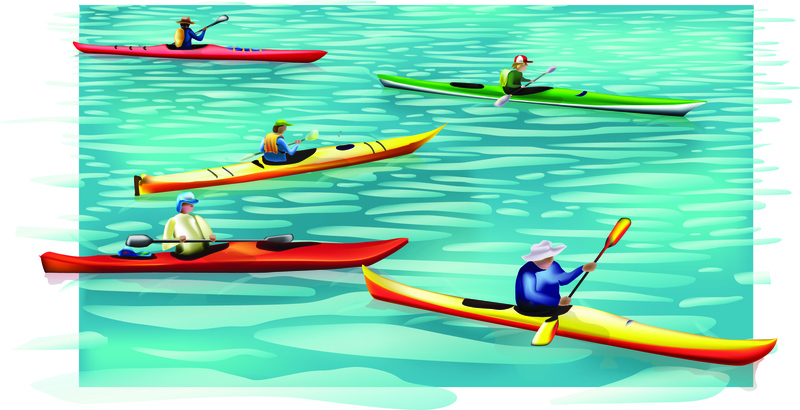 I love the overall colour and movement of the kayaks and water. I don’t think you need detail on the rowers faces, maybe add a bit of shadow to one side of his face to indicate nose and mouth. The rower and kayak in the middle seems a tad smaller then the two rowers in the background ( not in proportion) . Hmm, that type of thing escapes you when you look at the same picture for too long, I’ll get right onto that. I love your work, you have really mastered illustrator! You are my new illustrator mentor!